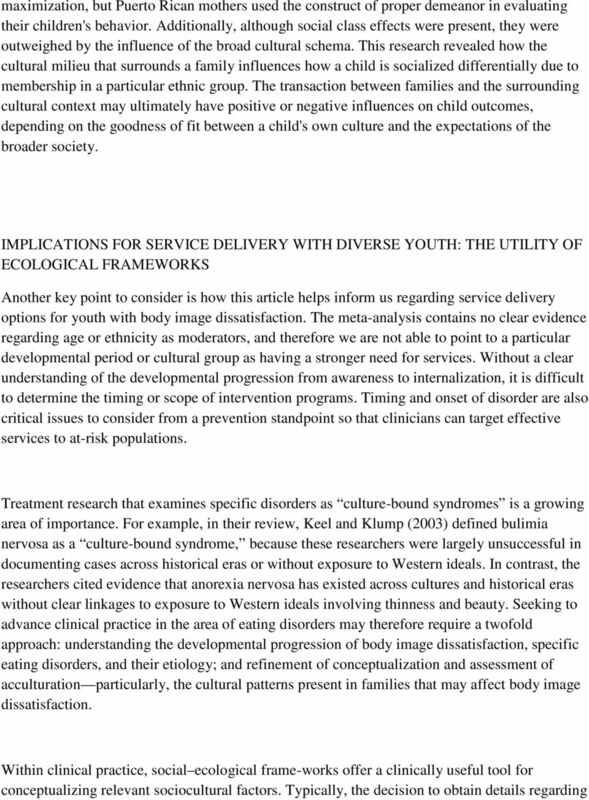 Conceptualizing sociocultural factors within clinical and research contexts. Download "Conceptualizing sociocultural factors within clinical and research contexts." 5 a client's ecology is determined at intake, with clinicians emphasizing referral issues, current symptoms, and perhaps family history in order to produce an accurate diagnosis. Yet, ecological factors can play a crucial role in determining whether individuals pursue initial treatment and, perhaps more important, benefit from clinical services. For example, access to transportation, economic status, shared world-view between therapist and client, or cultural patterns of conversation and self-disclosure are just some variables that may influence the treatment outcome. 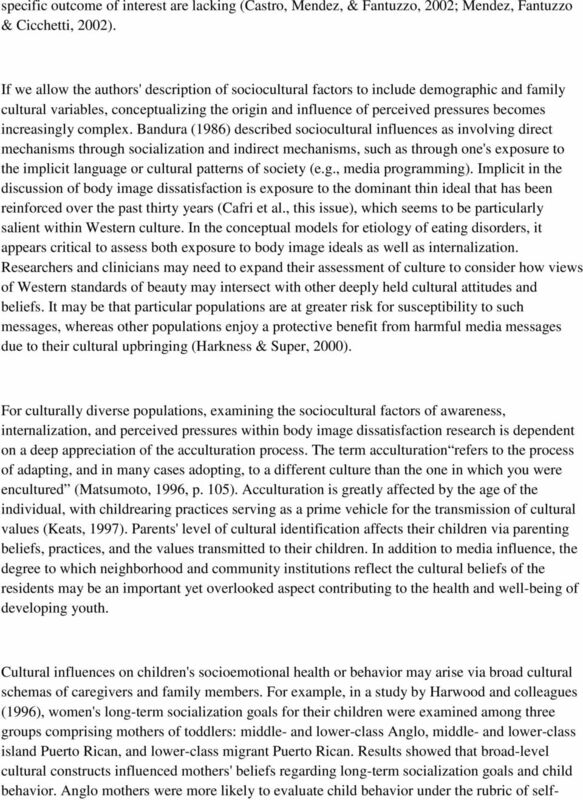 Nezu (2005) has stated that the prevalent practice of overlooking sociocultural influences in favor of intraindividual characteristics has emphasized a sense that all individuals exist within the same dominant culture (p. 21); treating individuals as such is clearly inconsistent with a code of ethical standards mandating cultural competence for clinicians. 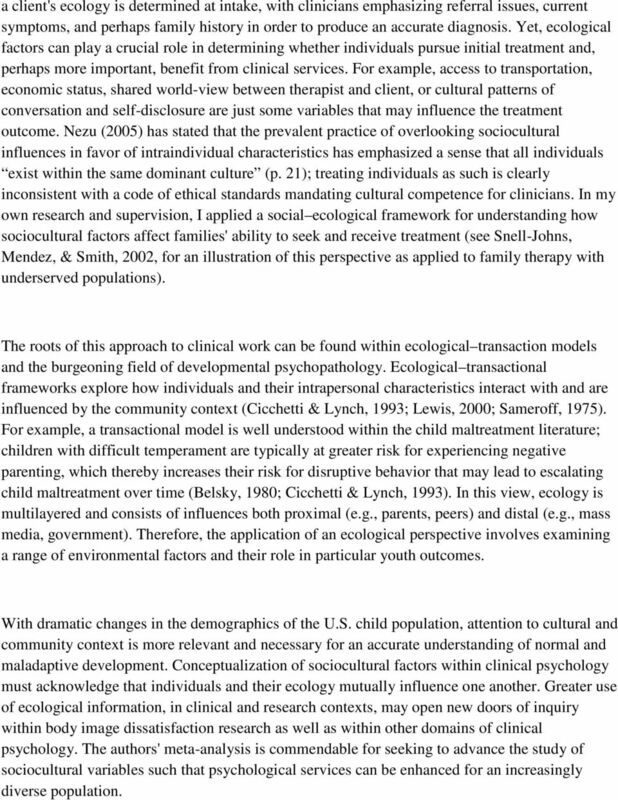 In my own research and supervision, I applied a social ecological framework for understanding how sociocultural factors affect families' ability to seek and receive treatment (see Snell-Johns, Mendez, & Smith, 2002, for an illustration of this perspective as applied to family therapy with underserved populations). The roots of this approach to clinical work can be found within ecological transaction models and the burgeoning field of developmental psychopathology. Ecological transactional frameworks explore how individuals and their intrapersonal characteristics interact with and are influenced by the community context (Cicchetti & Lynch, 1993; Lewis, 2000; Sameroff, 1975). For example, a transactional model is well understood within the child maltreatment literature; children with difficult temperament are typically at greater risk for experiencing negative parenting, which thereby increases their risk for disruptive behavior that may lead to escalating child maltreatment over time (Belsky, 1980; Cicchetti & Lynch, 1993). In this view, ecology is multilayered and consists of influences both proximal (e.g., parents, peers) and distal (e.g., mass media, government). Therefore, the application of an ecological perspective involves examining a range of environmental factors and their role in particular youth outcomes. With dramatic changes in the demographics of the U.S. child population, attention to cultural and community context is more relevant and necessary for an accurate understanding of normal and maladaptive development. Conceptualization of sociocultural factors within clinical psychology must acknowledge that individuals and their ecology mutually influence one another. 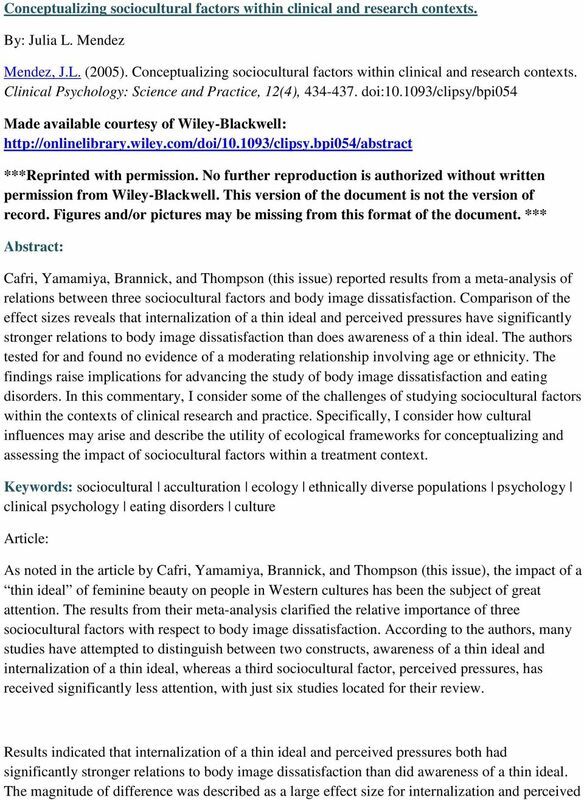 Greater use of ecological information, in clinical and research contexts, may open new doors of inquiry within body image dissatisfaction research as well as within other domains of clinical psychology. The authors' meta-analysis is commendable for seeking to advance the study of sociocultural variables such that psychological services can be enhanced for an increasingly diverse population. 6 ACKNOWLEDGMENT This article was supported in part by a Head Start Quality Research Center Consortium grant awarded by the Department of Health and Human Services. References Bandura, A. (1986). Social foundations of thought and action: A social cognitive theory. Englewood Cliffs, NJ : Prentice-Hall. Belsky, J. (1980). Child maltreatment: An ecological integration. American Psychologist, 35, Cafri, G., Yamamiya, Y., Brannick, M., & Thompson, J. K. (2005). 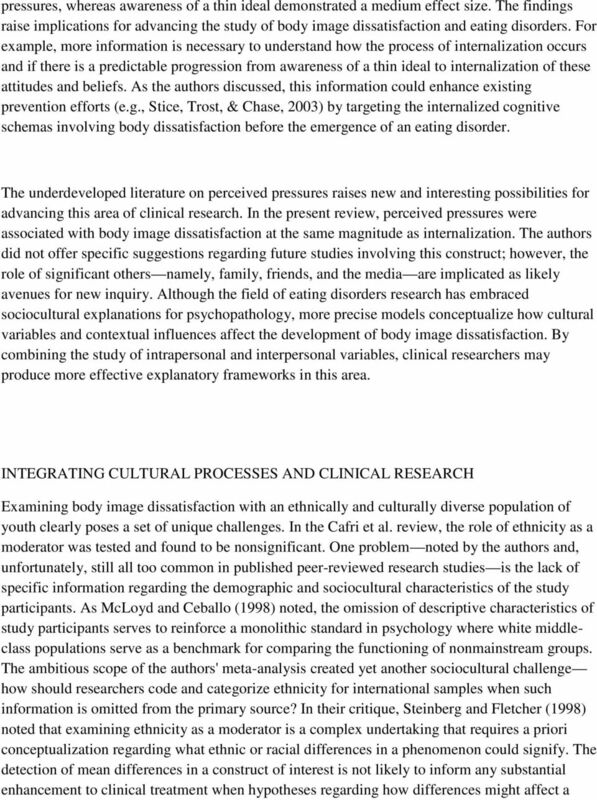 The influence of sociocultural factors on body image: A meta-analysis. Clinical Psychology: Science and Practice, 12, Castro, M., Mendez, J. L., & Fantuzzo, J. (2002). A validation study of the Penn Interactive Peer Play Scale with urban Hispanic and African American preschool children. School Psychology Quarterly, 17(2), Cicchetti, D., & Lynch, M. L. (1993). Toward an ecological transactional model of community violence and child maltreatment: Consequences for children's development. Psychiatry, 56, Harkness, S., & Super, C. M. (2000). Culture and psychopathology. In A. J.Sameroff, M. L.Lewis, & S.Miller, (Eds. ), Handbook of developmental psychopathology (2nd ed., pp ). New York : Kluwer. 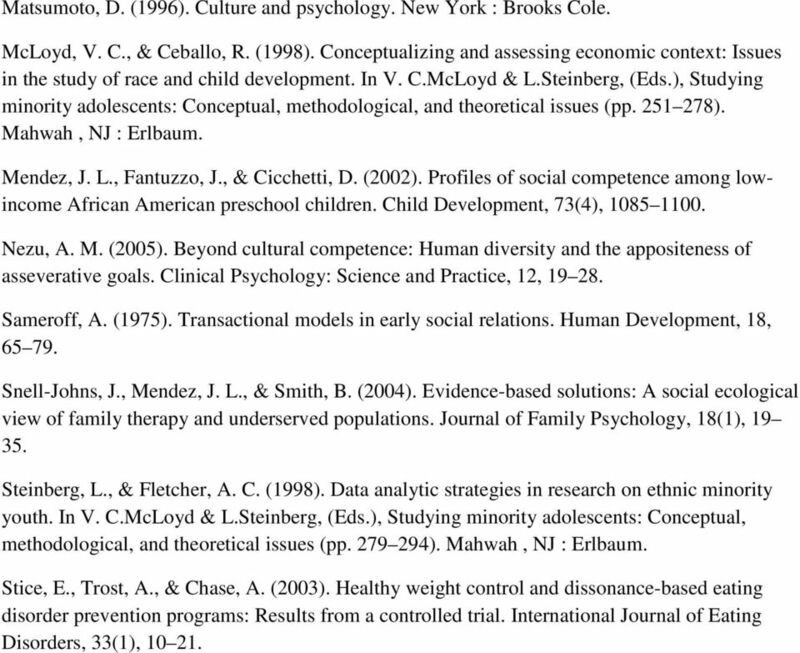 Harwood, R. L., Schoelmerich, A., Ventura-Cook, E., Schulze, P. A., & Wilson, S. P. (1996). Culture and class influences on Anglo and Puerto Rican mothers' beliefs regarding longterm socialization goals and child behavior. Child Development, 67, Keats, D. (1997). Culture and the child: A guide for professionals in child care and development. New York : Wiley. Keel, P. K., & Klump, K. L. (2003). Are eating disorders culture-bound syndromes? Implications for conceptualizing their etiology. Psychological Bulletin, 129(5), Lewis, M. (2000). Toward a development of psychopathology: Models, definitions, and prediction. In A. J.Sameroff, M. L.Lewis, & S.Miller, (Eds. 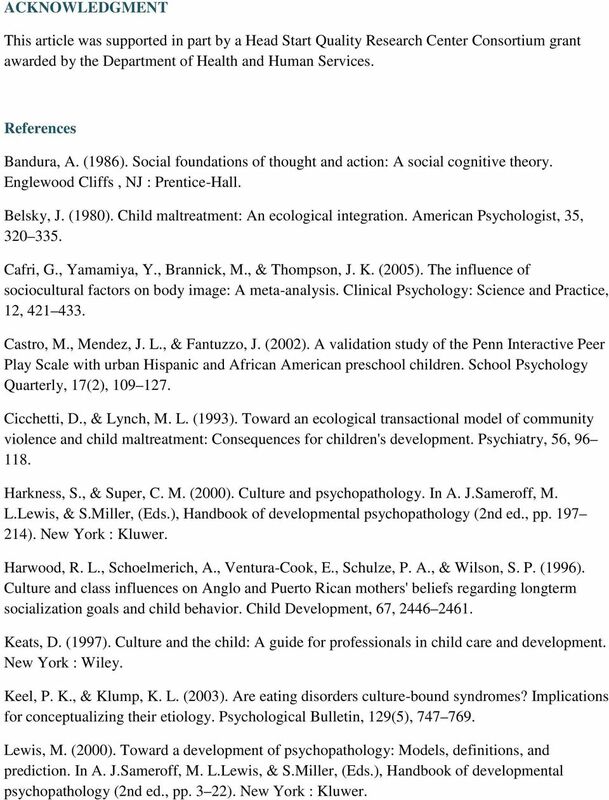 ), Handbook of developmental psychopathology (2nd ed., pp. 3 22). New York : Kluwer. CURRICULUM VITAE. B.S.in Psychology, University of New Orleans, New Orleans, LA (1990).